Early in this trip, we studied Marco Polo, while we visited Venice, his childhood home. Later on our travels, we revisited Marco Polo, as we viewed the colorful silks and Asian temples of China. 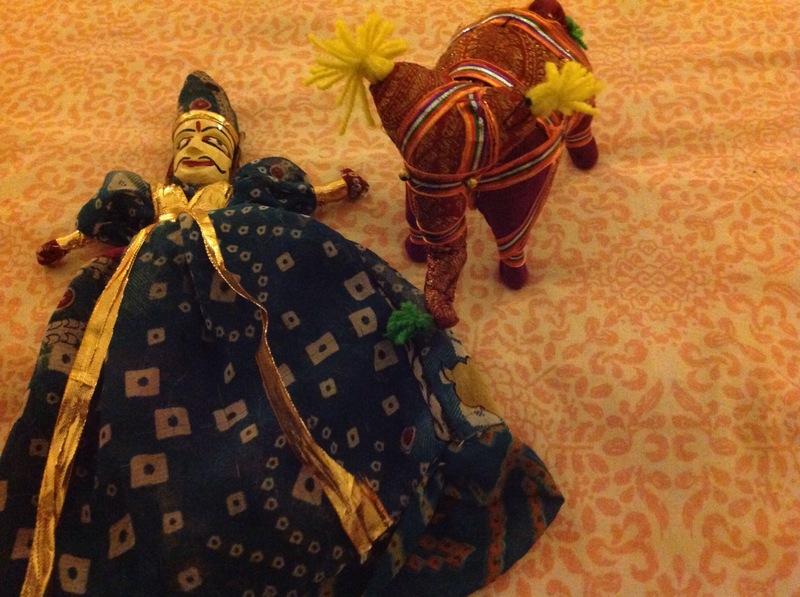 In India, we found ourselves right in the middle of the Silk Road, surrounded by desert traders, camel herds, and spices of all kinds in the local markets. Channeling the caravans, we tried our hand at riding both camels and horses. Boy declared that he preferred the horses, as they weren’t so tall; but he isn’t in a hurry to ride either again. 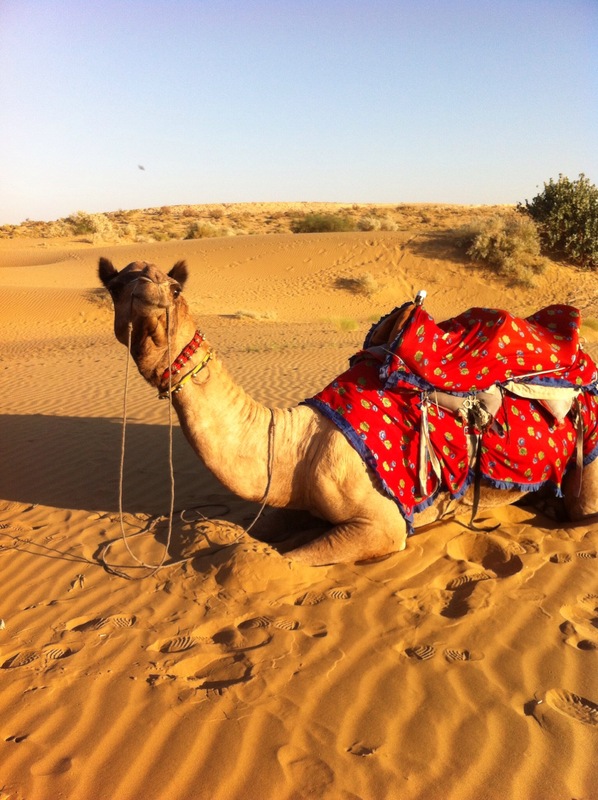 Over the course of a week, we explored the desert towns of Rajasthan, India. These smaller cities, and rural towns made it possible to forget that India was home to billions of people. We drove through areas with few residents, beyond a shepherd with a flock of sheep or goats. Camel carts pulled goods along the highway while cows slept in the shade. Roadside, we saw sandstone quarries, where the building materials for the cities were retrieved. These building materials were often used, in this area, to create Havelis, or mansions, inhabited by rich merchants, who controlled the trade along the Silk Route. Built to a standard plan, these structures were two or more stories, surrounding a set of three courtyards. One courtyard was used for business dealings, one for the family, and one for the servants and animals. 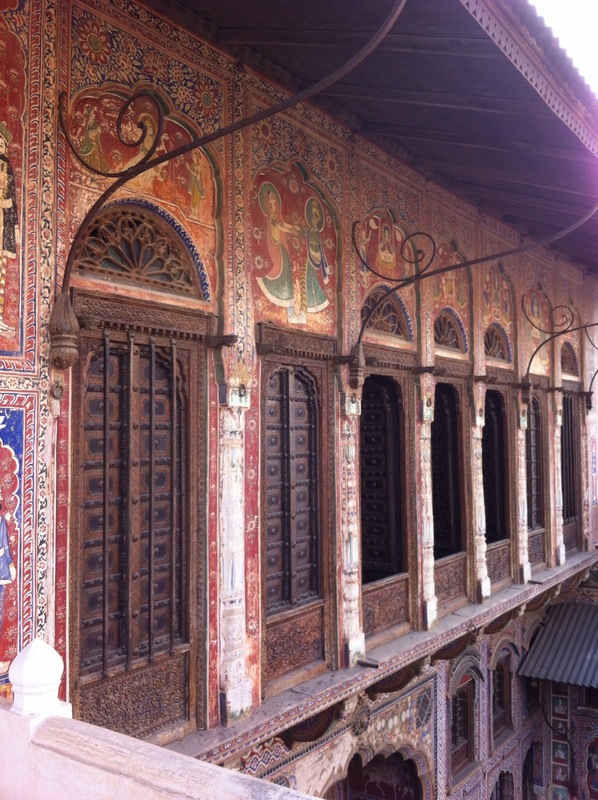 Each Haveli was more elaborately decorated than the next. Some Havelis were carved sandstone, with fanciful repeating patterns. 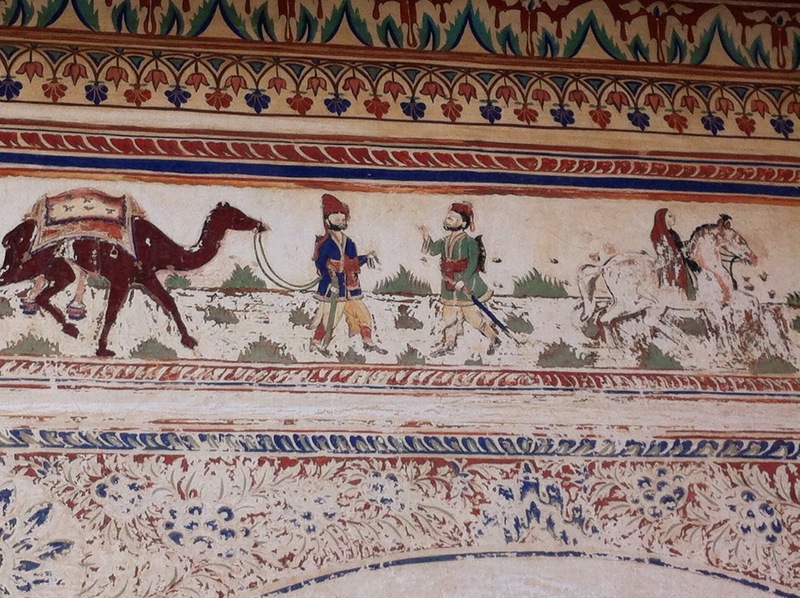 Others were colorfully painted with elaborate frescoes, of people, animals, and mythological stories. The paintings and carvings covered every inch of the building, ceiling to ground. An elephant image usually welcomed visitors through the main entrance. Built from ancient times right through to the 20th century, the later ones included images of motor cars, trains, telephone, and even airplanes. 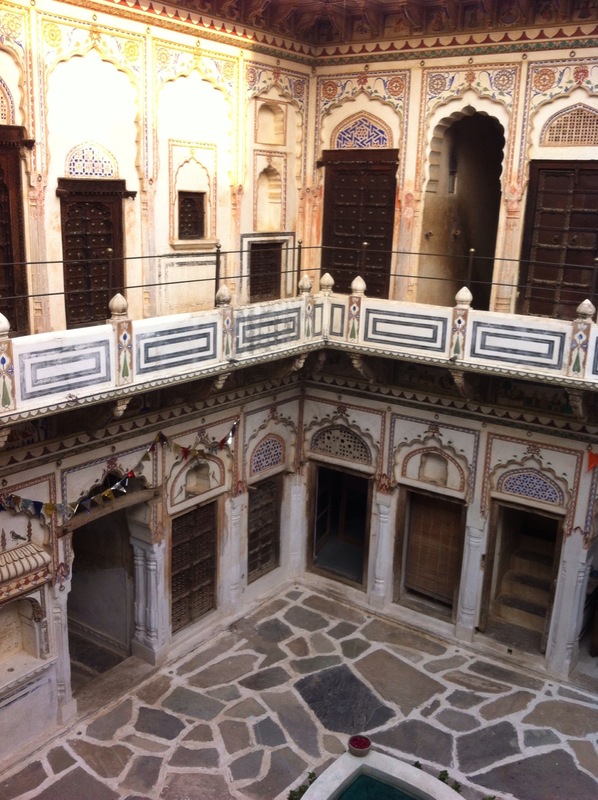 In the town of Mukundgarh, we were welcomed to a lovely frescoed Haveli where we spent a few nights. 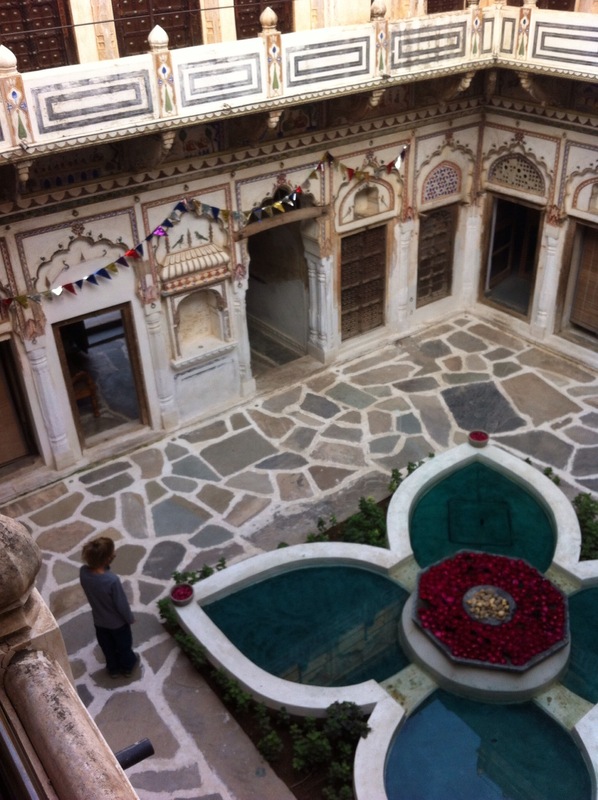 The Haveli had six, well apportioned rooms, though we were privileged to be the only guests during our stay. The food, from the in-house chef, was spectacular, and Boy didn’t even mind that it was all vegetarian. 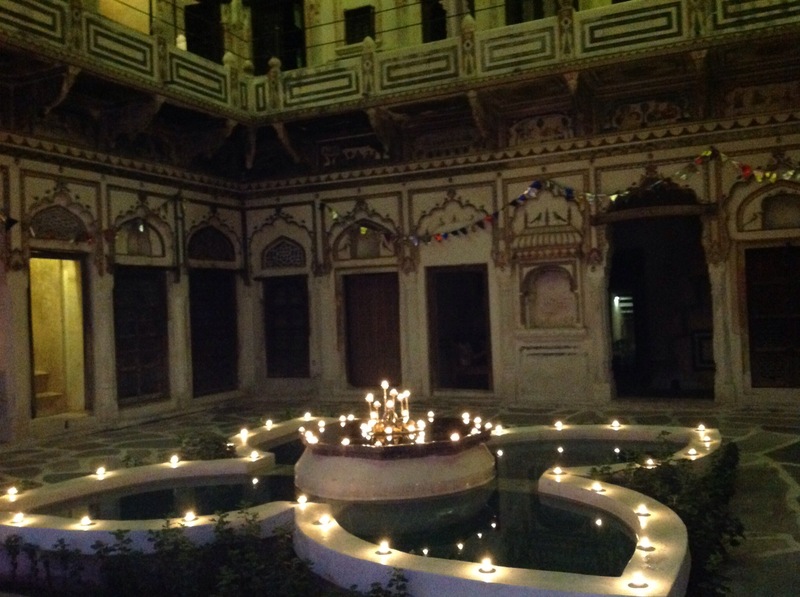 Evenings, we enjoyed the cool breeze from the roof and the lighted fountain in the central courtyard. We watched a number of local boys, all about his age flying kites after school from the roof of nearby buildings. They were practicing, we were told, for the January Kite Festival. Intrigued, Boy decided to try it. With the help of the staff, he managed to get one airborne from the roof of our Haveli, and we all enjoyed watching the red paper fly, high above our heads. Exploring further through the Thar Desert, we visited Jaisalmer fort and the Sam Sand Dunes, our closest stop to the India Pakistan border. Turning back East, we also stopped at Mehrangarh fort in Rohet. 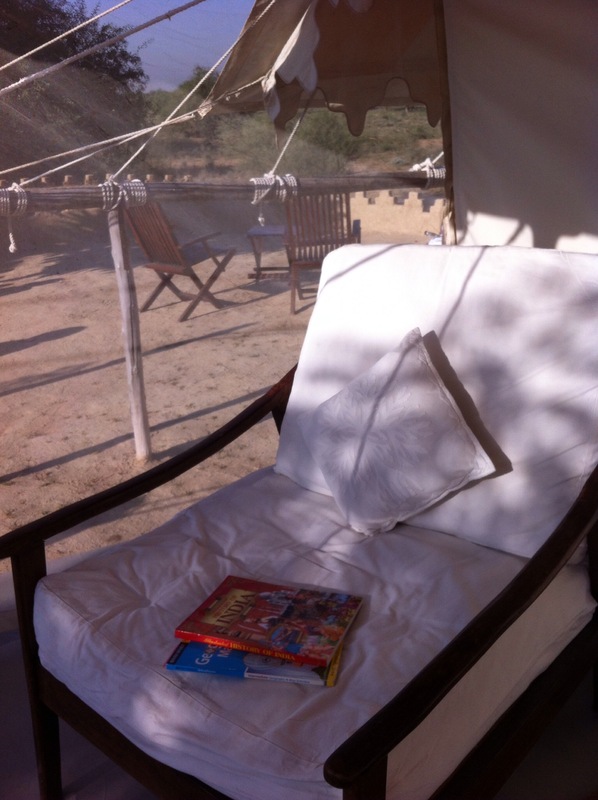 Our home in Rohet was a wilderness safari tent. Hardly roughing it, this luxury tent had running water, electricity, and a gourmet chef. It also had a beautiful view of the Milky Way, over the sparsely inhabited desert, inspiring some astronomy studies this week. A Jeep took us and our guide to visit two farming communities, where we met some Iocal families who had just finished bringing in the harvest. Boy was extremely interested to see the millet and lentils as they were still attached to the recently harvested plants and had not yet been separated into grains. We finished our desert sojourn by heading up into the mountains. Gaining more than 2000 feet in altitude, we drove all day to reach Udaipur, the Lake City. Home to several, large, man made lakes, Udaipur is cooler and greener, than any of the other towns we had seen in Rajasthan. The City Palace complex is still a residence of a local King, though much of it is open for tourists, and is now a museum. At the base of the City Palace, a boat took us across to the summer palace, situated on an island in Lake Pichola. It’s island location allowed for cool breezes during the hot summer season. We were glad to be visiting during the winter, when temperatures were only in the 80s F (low 30s C). 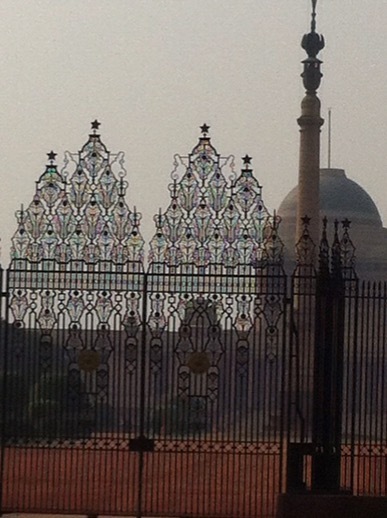 From Udaipur, we returned to Dehli, to complete our time in India. Though not our usual traveling style, we were glad that we arranged the help of a private tour in India, through Indian Moments. We were able to see far more than we would have on our own. Getting around was significantly more challenging than we had expected, and while navigating the traffic chaos, we were very pleased to have a local driver and guide to assist. The drive from Delhi to Agra is about 100 miles, but takes more than four hours though traffic. The roadside sights, leaving Delhi are different from those I have seen anywhere else. All aspects of human life are conducted within feet of the roadway, as if it were one great big living room. Barber chairs were set in the shade, carrying out shaves and haircuts with hand held mirrors. People slept, read, and brushed their teeth on chairs and beds set a few feet from the roadside. They lathered up for bathing with a bar of soap and a bucket. The housing made the townships of South Africa look like modern suburbs, in comparison. Lucky ones had a cloth sun shade or piece of plastic tarp to make a roof. There were no walls. It is hard to say how much Boy noticed, or took in, but there was certainly plenty to see. 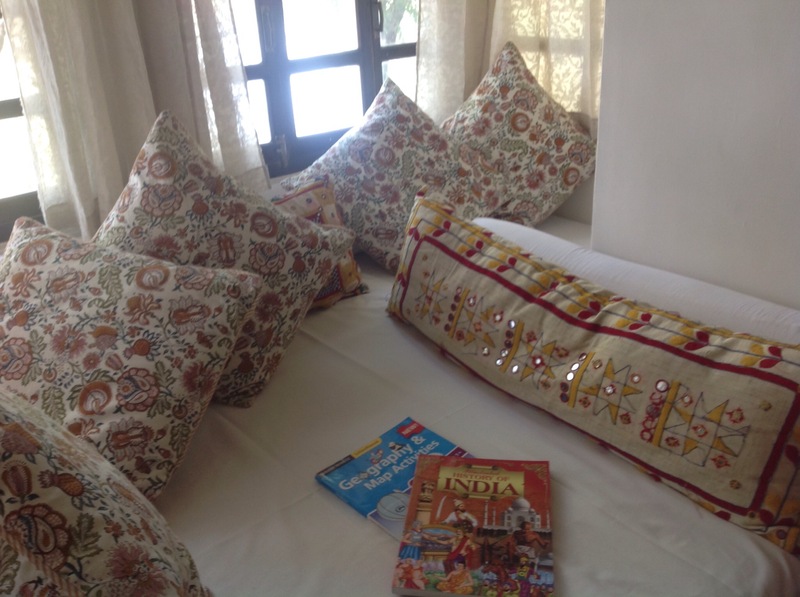 At Agra, our accommodation was a fancy hotel with a pool and a kids club. This made it a bit challenging to get Boy to leave for our afternoon viewing of the Taj Mahal and Red fort, though we did manage to drag him away, eventually. At the Taj Mahal, thousands of people gathered in the gardens to take photos. The building is indeed more beautiful and impressive in person than it ever appears in photos. We enjoyed the fountains, gardens, and building immensely, though Boy was a bit bothered by all the people wanting photos with him, and his light colored hair. In addition to the outside viewing, it is possible to see the inside of the building. The line stretched all the way around the base to enter the inner area of the building, far longer than even the queue we joined outside the Sagrada Familia cathedral, in Europe. Our guide purchased foreigner tickets for us (at the foreigner price, of course), that allowed us to skip the line to enter the building. The inside of the Taj Mahal is home to an elaborate tomb, with beautiful gemstones in the walls. The inside is quite small, and while they limit the number of people inside at a time, that number is way more than we found comfortable. The guide, Dad, and I made a wall around Boy, so he would not be crushed in the press of the crowd. Afterwards, we decided that viewing the exterior from the gardens was well worth the entrance, but in the future, we would skip the interior viewing. Returning to the hotel in the evening, we took Boy back to the kids club, where he was invited to join a birthday party for a six year old girl, visiting from Delhi, with her family. There were about six children at the hotel, and all were invited to join the celebration, with cake and Bollywood dancing. 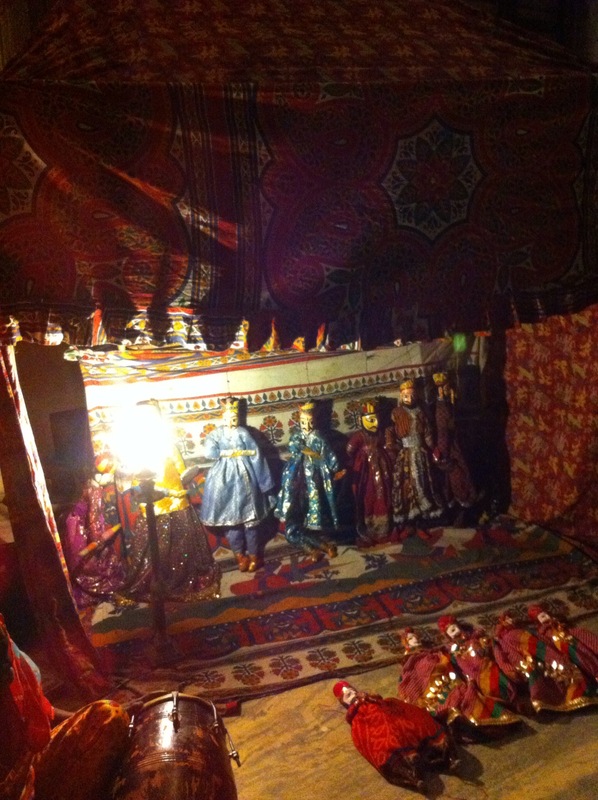 Afterwards, the hotel had a puppet show and magic show in the garden. 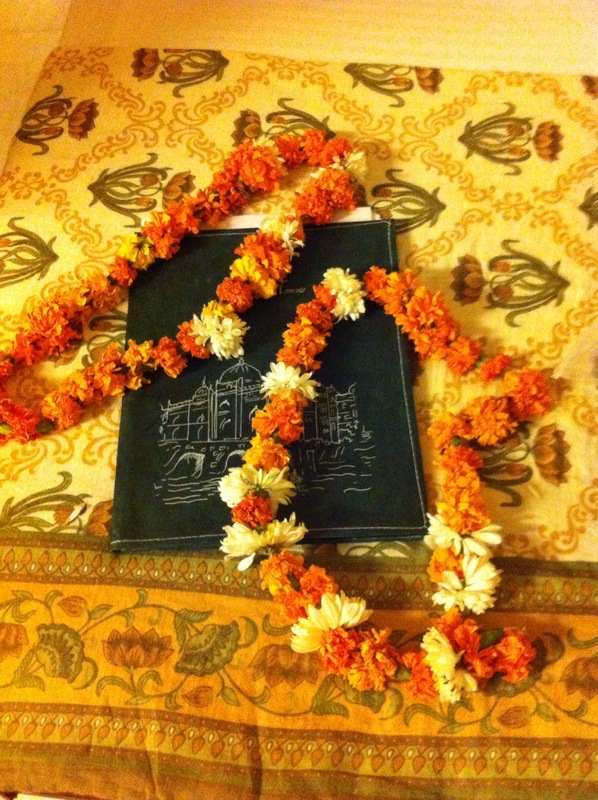 This cheered Boy tremendously, after his tiresome adventure at the Taj Mahal. Arrival into the Delhi airport was smooth and efficient from immigration through baggage claim. Leaving the airport, however, was significantly more chaotic. We booked a driver ahead of time to meet us and take us to our guesthouse, a move we appreciated as we left the parking structure. Though it was 10 PM, the streets were packed. Cars drove through the city, oblivious to lane lines. Oncoming traffic often came right at you, as they passed slower vehicles. These slower vehicles included donkeys, cows, and rickshaws. Toddlers stood right at the roadside watching traffic pass while their older siblings played instruments for coins or begged for money. At the guesthouse, we happily dropped our luggage and fell into bed, asleep within minutes. The next morning, up well before dawn, we were dressed and had completed schoolwork before we heard the morning call to prayer from the nearby mosque. I had difficulty gathering books for our India journey, so most of our reading this stop is e-books. We have enjoyed the picture book Grandfather Gandhi and an e-book we checked out from the library, Gandhi, A Manga Biography. We have also been reading lots of Kipling. We have read (and watched) The Jungle Book, Rikki Tikki Tavi, and some of the Just So Stories. While we usually organize all our travel ourselves, and travel independently, we were advised by several to get help with India, especially as there were many things we wished to see, and we were not planning to stay put in one city, as we have been doing in other places. This message was reinforced by an Indian American couple we met while in South Africa, who highly recommended finding a local guide. We researched many companies, offering both group and private tours, finally deciding on a private tour, with mid-range guest house and hotel stays. For about what we would pay to rent a car in other places, we were able to organize a driver and guide. We found this to be incredibly helpful, as the metro in Delhi is under construction, and reliable taxis, lacking. Motor tuk- tuks, however, are common. 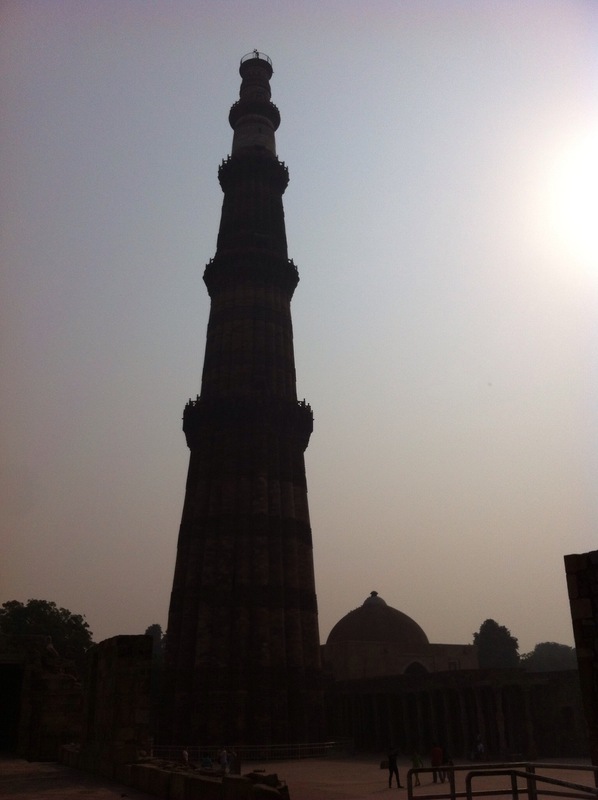 We spent our day in Delhi hitting the highlights, from India Gate, the minaret of Qutub Minar, the impressive Humayun’s tour (the inspiration for the Taj Mahal), and the memorial to Mahatma Gandhi. In the afternoon, we toured Old Delhi and the Chandni Chowk bazaar. A rickshaw ride through the market proved an exciting way to rest the feet. Despite the exciting sights, the time change caught up to us and by 6 pm, we were all asleep. From Agra, we began our journey west, towards Jaipur. On the way we stopped in the small village of Abhaneri. A few steps through the town takes you to an abandoned temple complex, and the Chand Baori, step well. From the outside, Chand Baori seems to be a small, grey, stone, structure. Entering the gate, it becomes a huge rectangle, larger than a city block. The grey stone has been excavated, creating a maze of stairs, an inverted square pyramid, descending nearly six stories into the ground. Decorated with fanciful carvings, and including a sunken temple near the old water line, we were reminded of Hollywood’s interpretation from Indiana Jones and the Temple of Doom. Thankfully, there were no lurking bad guys to chase us away. 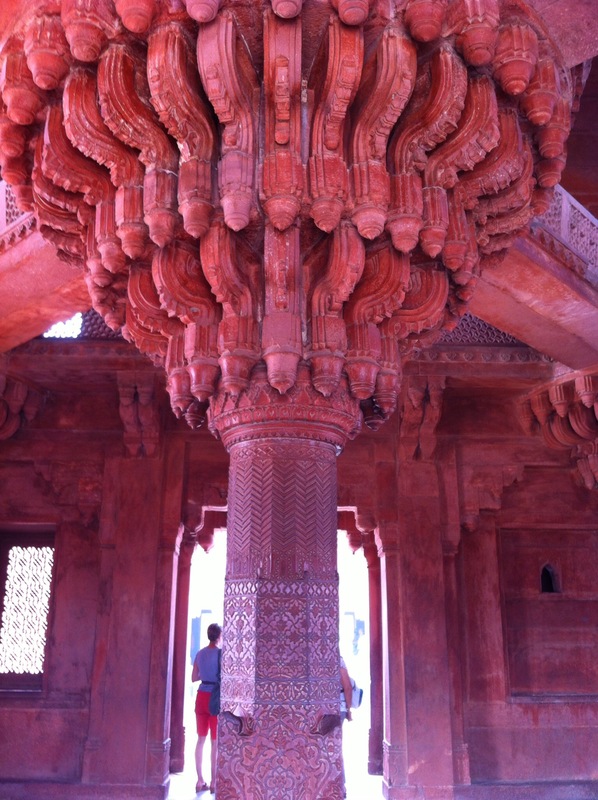 Pink, or red desert sandstone is common throughout the buildings of Northwestern India. This was not enough pink to satisfy the city of Jaipur, however. In the 19th century, to spruce up the city for a royal visit, the local leader ordered all the buildings in the old city to be painted, the color of the sandstone. While not quite true pink, rather, more of a terra cotta shade, pink was the way British journalists described the color to the people back home, earning Jaipur, the nickname, The Pink City. We started our touring day at the Amber fort and palace, an impressive defensive structure on a hill, with a wide wall surrounding the area. Similar to European castles, it had high walls, towers with arrow slits, and impressive entry gates to block attackers. A highlight was the mirrored palace, reminiscent of the Hall of Mirrors at Versailles. 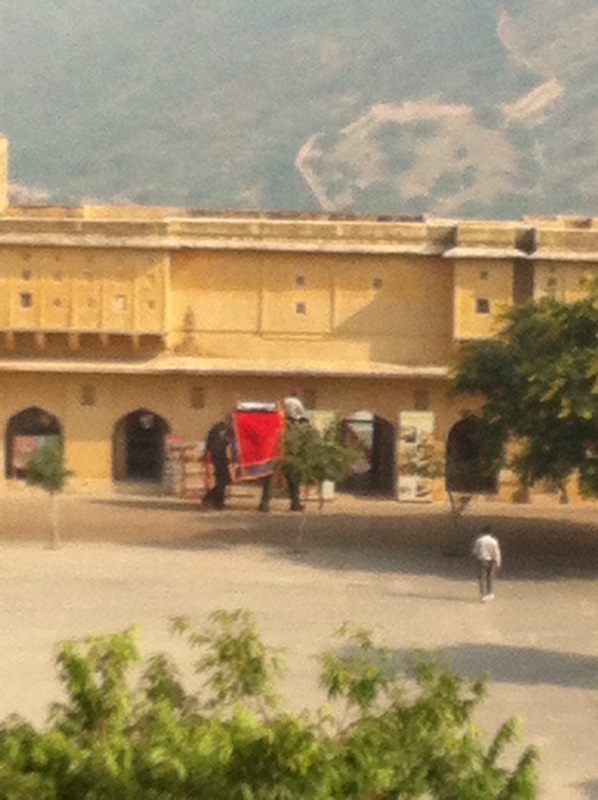 Boy was far more interested in the snake charmer, demonstrating his skill outside the gates to the fort. An elephant took us from the base of the hill to the top gate of the fort, a bumpy ride that Boy was not at all sure about. We, all three, sat together on a platform, with metal bars forming a back support and handles so we did not fall off. The entire contraption was attached like a saddle to the elephant’s back. We arrived safely at the top, and Boy was very proud to dismount and look back at the distance we had come, on top of the elephant. The ancient city observatory of Jaipur was another favorite of Boy. He enjoyed running through the towering 17th century sundials and watching the shadows pass through the seconds markings. Feeling adventurous, we left the observatory and went for a walk through the spice and flower market. Dodging motorbikes and tuk tuks, we enjoyed the smells and colors of the active market. Keeping all of us out of traffic took some practice, but we had a pleasant stroll and Boy found a shop selling chocolates, so he was happy, too. Later, we had a chance to see how local craftsmen make the beautifully colored and patterned cloth used in bedding, tablecloths, and wall hangings. The ink is transferred to the cloth with elaborately carved blocks. These each print a single color onto the cloth. Another complementary shaped carved block is used to imprint the second color, and then the third color, and so on. Some of the cloth is printed with up to seven layers of color. 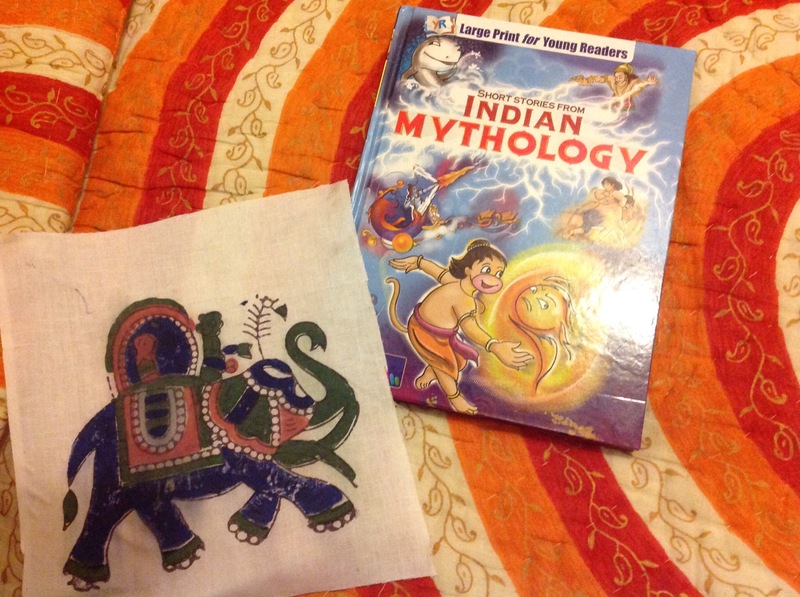 Boy was given a small square of cloth, and with some help, managed a four color print of an elephant. He was very pleased with the result, as you can see below. I had a find as well, coming across a bookshop with English language children’s books. 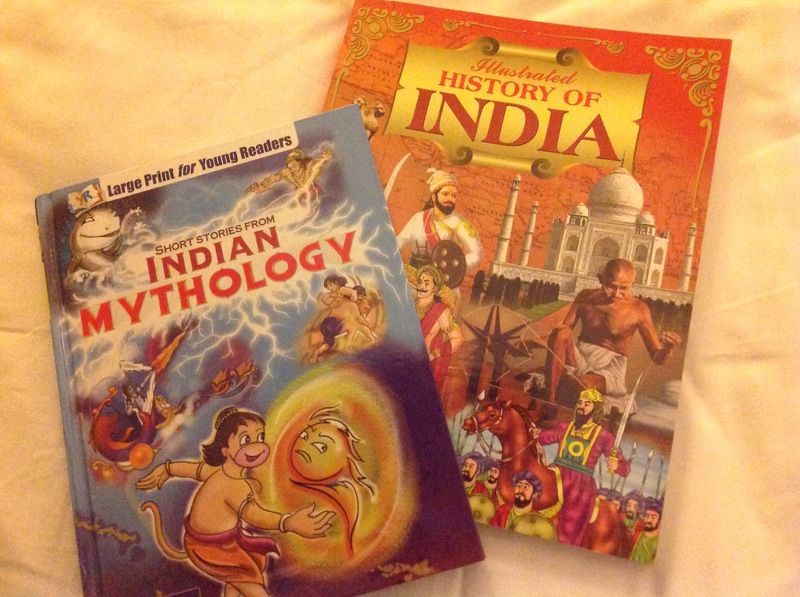 We added a few of the Indian myths to our studies for the week. While not venturing too far off the beaten path on our world tour, we have been to a few spots where we have found ourselves the center of attention. Having been to China, both International cities like Shanghai and domestic cities in China, like Wuxi, on business in the past, both Dad and I had experienced the stares and photographs of people who had never seen a “Westerner” before. We told our stories to Boy, to help prepare him for this. While Hong Kong is a more mixed city, we had been warned by other traveling parents that Hong Kong Disneyland is a stop for many Mainland Chinese tourists on their first visit outside of China proper, so Western children sometimes experienced some of this type of attention there. We found as we toured the sights in Hong Kong, like Victoria Peak, that we did not notice any unwanted attention, but whenever we passed a school group on a field trip, the children would excitedly say “hello,” and wave at Boy to practice their English. He was a bit embarrassed, but not distressed. At Hong Kong Disneyland, we were pleased that we were not subject to much attention, at all. A few people pointed and giggled at his light hair, but Boy was not bothered. Just outside the entrance, we met another school group, with children his age and their teacher, conducting a short survey for their English class, The students greeted us politely, asked if we would help their school work, and asked each English speaking visitor three questions: which continent are you from, are you here for tourism or business, and what was your favorite sight in Hong Kong (from a list of 10). The teacher explained that this was to practice spoken English, and then they would graph the answers, when they returned to school. We enjoyed this little interaction, and smiled as we went on our way. It never occurred to us to expect this attention in India, assuming that as a former British colony, Western people were not unknown. We found this was not the case everywhere we went. 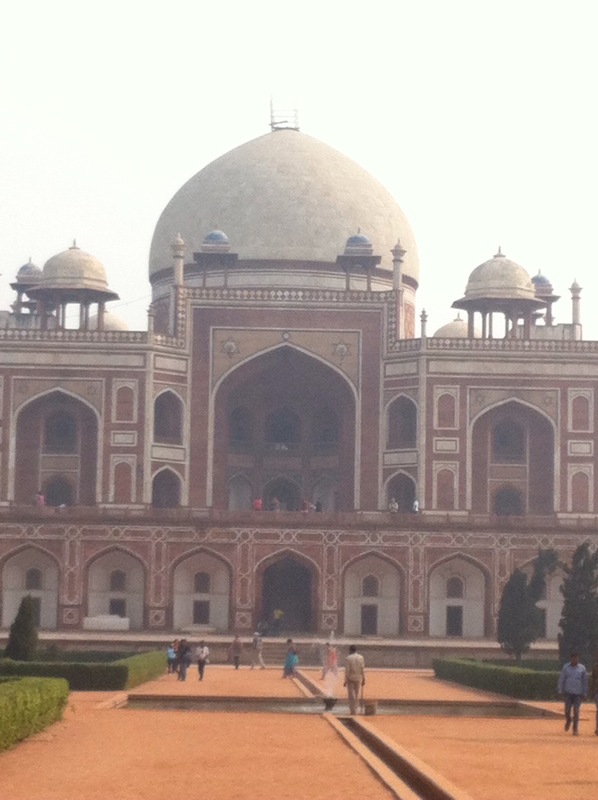 In Delhi, at several of the monuments, we passed school groups, who like the ones in Hong Kong, all waved and said “hello” to Boy as we passed. A few times, we were approached, and asked if we would pose for a photo. I declined. While walking about, I did notice several people surreptitiously snapped us, but Boy was oblivious. 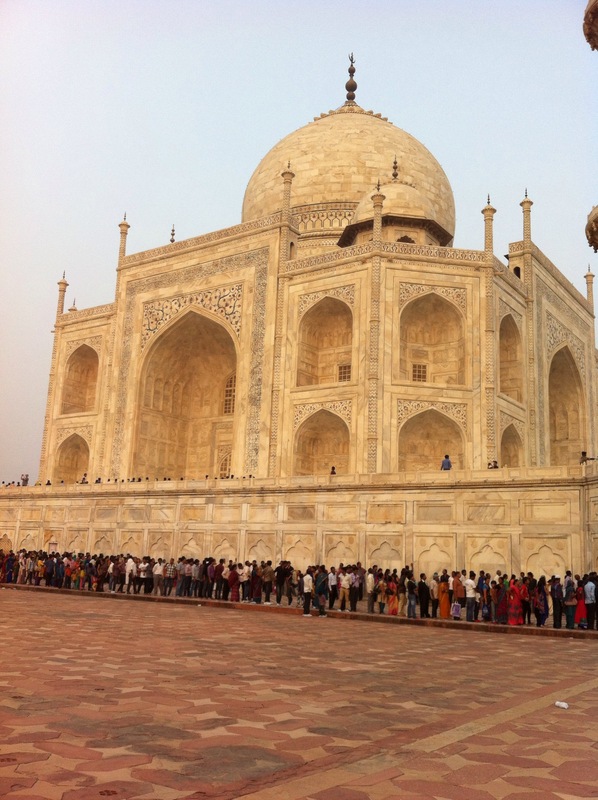 By the time we reached Agra, however, the crowds and attention increased. Our guide told us, this time of year, many of these were domestic tourists, who had not seen non-Indians before. While the school groups still shouted “hello,” the tourists no longer asked permission before taking Boy’s photo. Schoolgirls reached out to touch Boy’s hair. 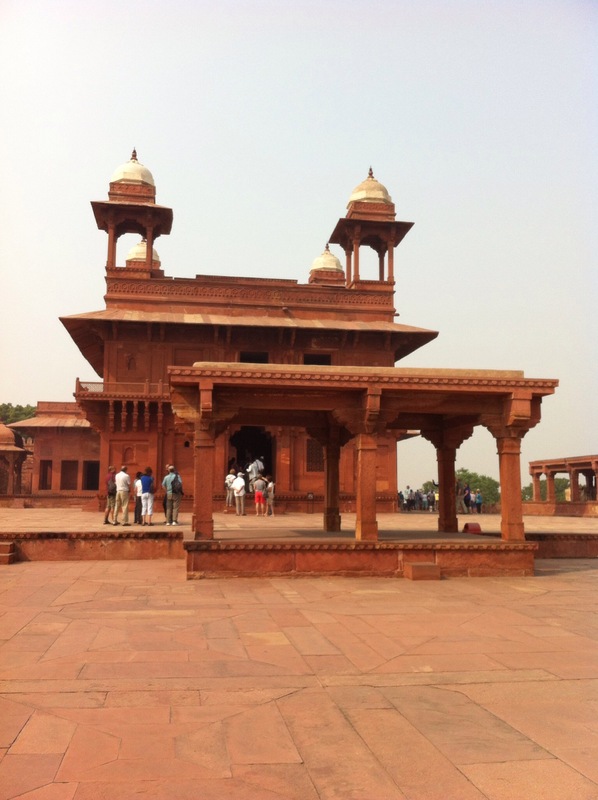 While taking our photos, at the Red Fort in Agra we were often photo bombed. Sometimes while we posed, an entire family would surround us to take their own group shot with us in the middle. At the Taj Mahal, the more aggressive tourists would stop Boy, without asking, and grab his arm for a pose with them or their children. While standing in front of one of the world’s most iconic buildings, Boy was more interesting to some people than the Taj Mahal. He hated this part, and was glad when we left the Taj. Thankfully, after leaving Agra, the other places we have been in India have not been so intense.